Tens of thousands of Haitians spontaneously poured into the streets of Port-au-Prince on the morning of Mar. 12, 2007. President Hugo Chávez had just arrived in Haiti all but unannounced, and a multitude, shrieking and singing with glee, joined him in jogging alongside the motorcade of Haiti's then President René Préval on its way to the National Palace (later destroyed in the 2010 earthquake). There, Chávez announced that Venezuela would help Haiti by building power stations, expanding electricity networks, improving airports, supplying garbage trucks, and supporting widely-deployed Cuban medical teams. But the centerpiece of the gifts Chávez brought Haiti was 14,000 barrels of oil a day, a Godsend in a country that has been plagued by blackouts and power shortages for decades. The oil was part of a PetroCaribe deal which Venezuela had signed with Haiti a year before. Haiti had only to pay 60% for the oil it received, while the remaining 40% could be paid over the course of 25 years at 1% interest. Under similar PetroCaribe deals, Venezuela now provides more than 250,000 barrels a day at sharply discounted prices to 17 Central American and Caribbean countries, including Haiti, Guatemala, Honduras, Jamaica, Cuba, Nicaragua, and the Dominican Republic. The cost of the program is estimated at some $5 billion annually. But the benefits to, and gratitude from, PetroCaribe recipients are huge, particularly during the on-going global economic crisis. In short, Caracas is underwriting the stability and energy security of most economies in the Caribbean and Central America, at the same time challenging, for the first time in over a century, U.S. hegemony in its own "backyard." Washington's alarm over and hostility to PetroCaribe is layed bare in secret diplomatic cables obtained by the media organization WikiLeaks. Then U.S. Ambassador to Haiti Janet Sanderson rebuked Préval for "giving Chávez a platform to spout anti-American slogans" during his 2007 visit, said one cable cited in an article which debuted in June 2011 a WikiLeaks-based series produced by Haïti Liberté and The Nation. Reviewing all 250,000 secret U.S. diplomatic cables which were later released, one realizes that Sanderson wasn't the only U.S. diplomat wringing her hands about PetroCaribe. "It is remarkable that in this current contest we are being outspent by two impoverished countries: Cuba and Venezuela," noted U.S. Ambassador to Uruguay Frank Baxter in a 2007 cable released by Wikileaks. "We offer a small Fulbright program; they offer a thousand medical scholarships. We offer a half dozen brief IV programs to 'future leaders'; they offer thousands of eye operations to poor people. We offer complex free trade agreements someday; they offer oil at favorable rates today. Perhaps we should not be surprised that Chávez is winning friends and influencing people at our expense." We can now expect the Washington's "contest" with Venezuela to escalate dramatically as it attempts to take advantage of the Bolivarian regime's vulnerability during the transition of power. Already Vice President Nicolas Maduro, whom Chávez asked Venezuelans to make his successor, has sounded the alarm. "We have no doubt that commander Chávez was attacked with this illness," Maduro said on Mar. 5, repeating a suspicion voiced by Chávez himself that Washington was somehow responsible for the fatal cancer he contracted. "The old enemies of our fatherland looked for a way to harm his health." Maduro also announced on national television on Mar. 5 "that a U.S. Embassy attache was being expelled for meeting with military officers and planning to destabilize the country," the AP reported. A U.S. Air Force attaché was also expelled. In short, just as the imperative to secure oil has driven the U.S. to multiple wars, coups, and intrigues in the Mideast over the past 60 years, it is now driving the U.S. toward a major new confrontation in Latin America. With Chávez's death, Washington sees a long awaited opportunity to roll back the Bolivarian Revolution and programs like PetroCaribe. In recent years, Chávez has led Venezuela to nationalize dozens of foreign-owned undertakings, including oil projects run by Exxon Mobil, Texaco Chevron, and other large North American corporations. The future of the hydrocarbon resources in Venezuela's Maracaibo Basin and Orinoco Belt, recently declared to be the world's largest, will soon reveal itself to be the central economic and political issue, and hottest flashpoint, in the hemisphere. 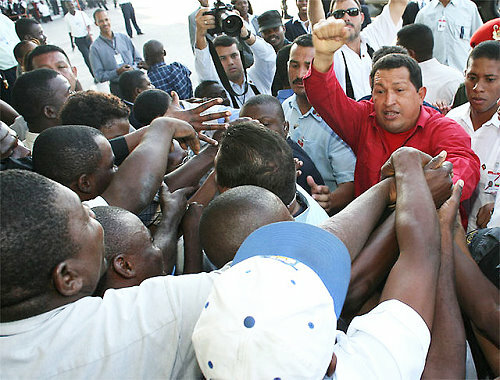 In the case of Haiti, Hugo Chávez often said that PetroCaribe and other aid was given "to repay the historic debt that Venezuela owes the Haitian people." Haiti was the first nation of Latin America, gaining its independence in 1804. In the 19th century's first example of international solidarity, Haitian revolutionary leaders like Jean-Jacques Dessalines and Alexandre Pétion provided Francisco de Miranda and Simon Bolivar, South America's "Great Liberator," with guns, ships, and printing presses to carry out the anti-colonial struggle on the continent. And this was the dream that inspired Hugo Chávez: a modern Bolivarian revolution sweeping South America, spreading independence from Washington and growing "21st century socialism." PetroCaribe was Chávez's flagship in that "contest," as Ambassador Baxter called it. Ironically, it was former Haitian president Jean-Bertrand Aristide who first foiled U.S. election engineering in Latin America in December 1990, but his electoral victory was cut short by a September 1991 coup. Hugo Chávez was the next Latin American leader to successfully carry out a political revolution at the polls in 1998. His people defeated the U.S.-backed coup that tried to unseat him in April 2002. Due to his strategic acumen, his popular support, and the goodwill created with PetroCaribe, Chávez's prestige grew in Venezuela and around the world during his 14 years in power up until his death today, which will bring a huge tide of mourning across Latin America. The eulogies will be many, but former U.S. Attorney General Ramsey Clark, who personally knew and worked with Chávez, made a prescient observation in January that stands out: "In my opinion, history will judge the contributions of Hugo Chávez to Latin American as greater than those of Bolivar."